Gift Giving Made(a little) Easy (ier)! Welcome everyone! Today I wanted to share with you how this wonderful paper by 3M has allowed me to stay on top of gift giving. If you are like me, I always want to give a gift, and would prefer it be homemade, but often do not have the time and at the last minute end up going to purchase something store bought and overpriced! I decided to make up some altered journals in my spare time in the craft room to have on hand for gifting. Once an occasion arises, I simply dash to the cricut and cut out a monogram with my 3M Post It paper, peel and stick! Instantly ready for gifting. Seriously - no having to wait for glue to dry, worrying about making a mess, etc! I love it and hope you do to! Good Thursday morning! I have had the wonderful experience of being on the Christian Paper Crafts Design Team and just got to work with my first vendor product. I have to say, this paper is AWESOME and I am sure paper crafters of all sorts are going to fall in love. 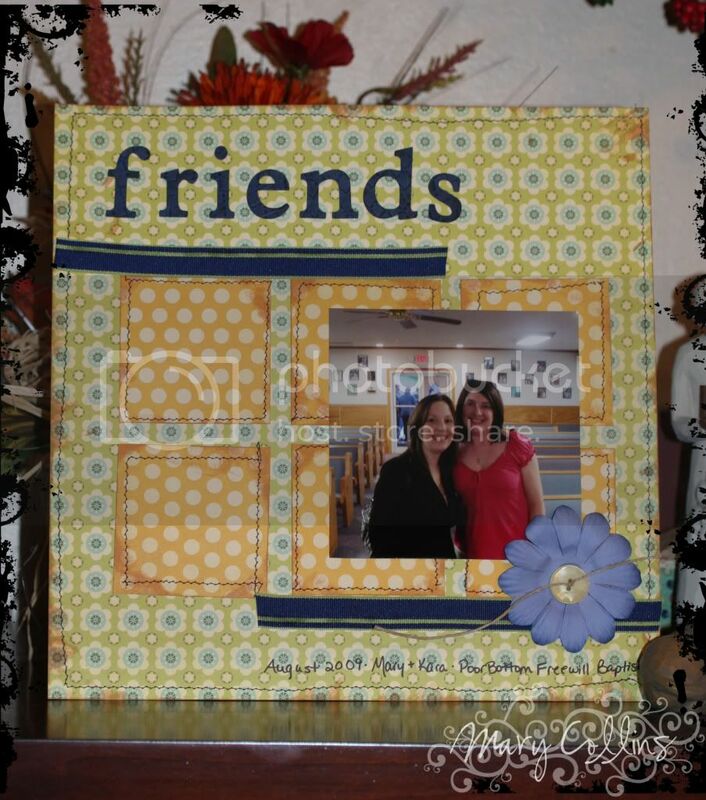 Normally, I am a scrapbook kind of girl. Give me a product and I'll give you back a page, but today I wanted to spice things up a bit! Using the 3M Post It crafting papers, I creating letters on the cricut using the Storybook cartridge for the front of my mommy's choir book at church. You can see the project in the Christian Paper Crafts gallery by clicking here, or the description over on Christian Paper Crafts by clicking here. Have a wonderfully blessed day and remember that God Loves You! Let me tell you - I have been a sewing machine lately! I love working on Abby's quilt for Christmas and since my sewing machine is sitting on the island (thanks for not saying anything about that sweetie) - I decided to give sewing on scrapbook paper another whirl! I am loving the feel that it gives and it really is so much fun!! Do you want member badges to dress up your profile and posts? 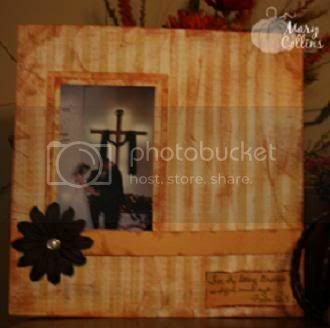 Christian Paper Crafts now has them available for you! You can purchase them for yourself or for a friend. In becoming a King’s Daughter, you will receive this exclusive icon representing your generous $50 contribution to Christian Paper Crafts. Your King’s Daughter membership is good for one year. When you register at Christian Paper Crafts, introduce yourself and make at least 10 posts, you will receive this member badge for free! 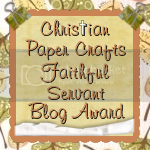 Link Christian Paper Crafts to your blog or website and receive this badge for your profile. Become a Gospel Girl by making at least 500 posts and receive this badge. For a donation for as little as $10, we are thanking you with a special Gift Badge for your membership badge collection. Want to purchase a badge for somebody else? Go to your member profile and purchase the badge you wish to give to another member. Put the member’s name in the comment section and the Helping Hand badge will be added to your profile. Acknowledge and recognize other members as Big Blessings by purchasing this badge for $5. Leave the member’s name in the comments section who is to receive this. You can receive this badge by donating to our adopted ministry of ROCK Romania for $5. This badge is available for purchase from February 1-15. This badge is available for purchase from April 1-15. Celebrate our one year anniversary with us on May 1, 2010. This badge is available on May 1, 2010 only. This badge is available for purchase from June 1-15. This badge is available for purchase from August 1-15. This badge is available for purchase from October 1-15, but we are offering it this year to you starting tomorrow through November 3. This badge is available for purchase from December 1-15. I adore my daddy! I always have. I feel so blessed when I am able to see my little Abby with my dad and witness the special relationship she has with her "Pap". Don't get me wrong, she loves her "Mam" better than Mac&Cheese (her favorite meal), but there is something about "Pap" and when she says his name he melts... He always has and I suppose always will! 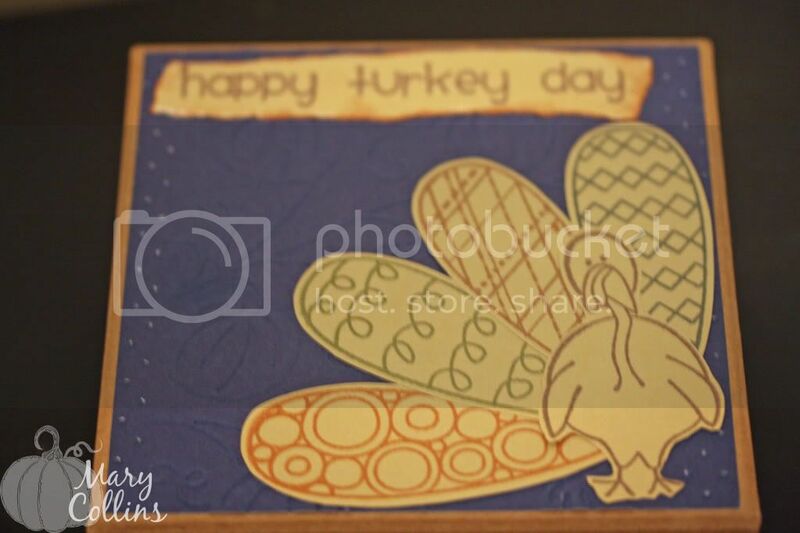 This page is made with all My Mind's Eye Papers, except the Papertrey Ink Kraft cardstock. The flowers are made from both the Cricut and Unity Stamps September 2009 Kit of the Month! Inks are Close to my heart. 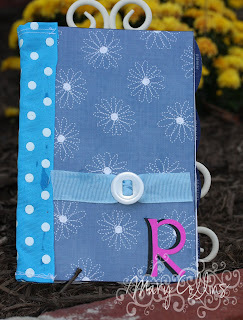 Button, ribbon, making memories journaling spot, and jute also used. I hope you all have a wonderfully blessed weekend! It will be pretty busy for us, Saturday is my daddy's birthday, as well as the bike ride at the church for Relay for Life and Sunday is Pastor Appreciation Dinner at our church. I wonder if you can guess who has to do some cooking Friday night and Saturday morning! I am so tickled to show this to you! 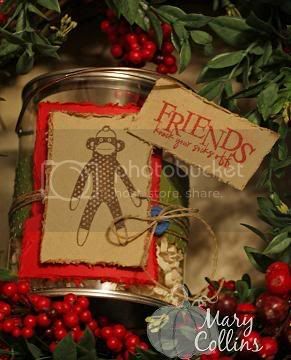 I made it for the Fun on Friday Challenge at Christian Paper Crafts last week where we were to use Pottery Barn as our inspiration :o)! I found a precious bedroom in Pottery Barn Kids and knew I had paper to match it right away. Oh I love this page! 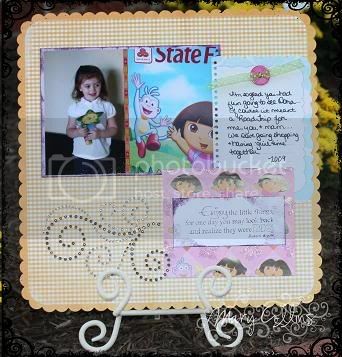 It is such a contrast from the Dora page! I was able to go back to my shabby inked edges that I am so much more at home with! The majority of the items used here are Making Memories, with a little lace, and some prima bling thrown in for good measure! Oh, and those lovely letters are K&Co and ever so sparkly and girly in real life! Oh for the love of Dora! Well, I guess I should clarify, Abby has the love of Dora, I have the love for Abby - thus the reason for a road trip to see Dora Live this past Summer! Did she love it - YES! Did I love it - NO! It started with me getting halfway there and having to turn around and drive back to get my debit card (nope, it wasn't a short trip either), hotel mixed our reservations up, and the show was not worth the money (rude people and seating attendants made it that way). Was it worth it - actually yes! Just seeing the smile on her face made it more than worth it! I have to tell you, I really love my husband. I am sure there are many people who say that, and I don't doubt that they really mean it, but I really do love mine! You see, being in school full time, plus working full time, with a 2 year old can get pretty hectic at times. When you add that in with how busy we stay doing things with our church, and I often spend Saturdays trying to make up to Abby being so busy during the week...you get the picture! My hubby is very helpful and always reminds me to take care of myself. 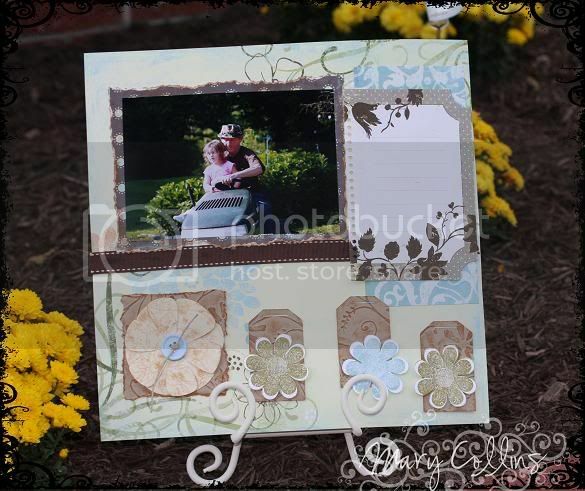 I have been trying to work on our wedding scrapbook recently, little-by-little! I would like to have it done by our anniversary next June...or Christmas 2010 at the rate I am going LOL :o) When people first look at the picture on this page they think it is off center, but we really wanted the cross at the center to symbolize Christ as the center of our marriage! The page was made from items I already had in my huge stash that I am trying to dwindle down! Our Relay for Life Crop was so fun and such a success, I find myself still missing it :o( Thankfully, I have been asked to do more, I guess sort of mini-crops in the near future!! Everyone loved the workshop and I hope to keep coming up with more and more! The money is going to such a good cause, and the fellowship is priceless! 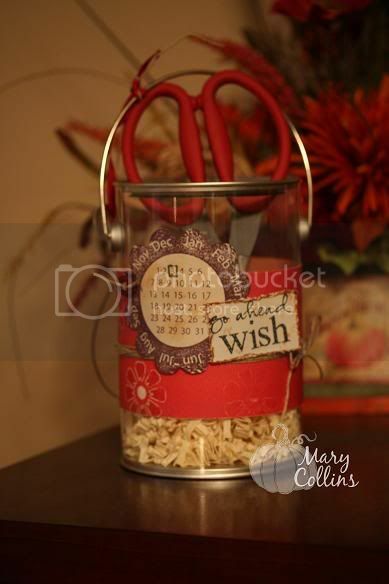 This is a little clear paint tin that I altered and added the door prize in - Tim Holtz scissors! Now anyone who has tried these knows why they are a real prize! The stamp set used was Unity! Wow! It seems as if this week has taken forever to crawl by for me... How about you? My wonderful hubby and I have been praying about a big decision, so perhaps that is why it has went so much slower. It is so much easier to give others advice to "pray and listen to God, just do what He wants you to do", then it is to use the advice yourself. Thankfully I know that all things are possible through Christ who strengthens me (Phil. 4:13) and have to remind myself that I must decrease for Him to increase (paraphrase of John 3:30). Please keep us in your prayers. Moving on to a little craftiness in the world :o) Nothing takes your mind off of "other" stuff and helps me to relax than being surrounded by my paper! It's my me time, well, my Me & God time, really! On to explain the photo at the top! I apologize in advance that these are not great photos - I took them (too) early this morning! You see, my laundry room is...well... it's just not right! I mean - the size of it is odd, the layout is odd, and it also doubles as my pantry... Trust me - weird! It is the only room in the house with paneling, too! I know - weird! I never could bring myself to spend money to decorate in there because - I just plain don't like the room... 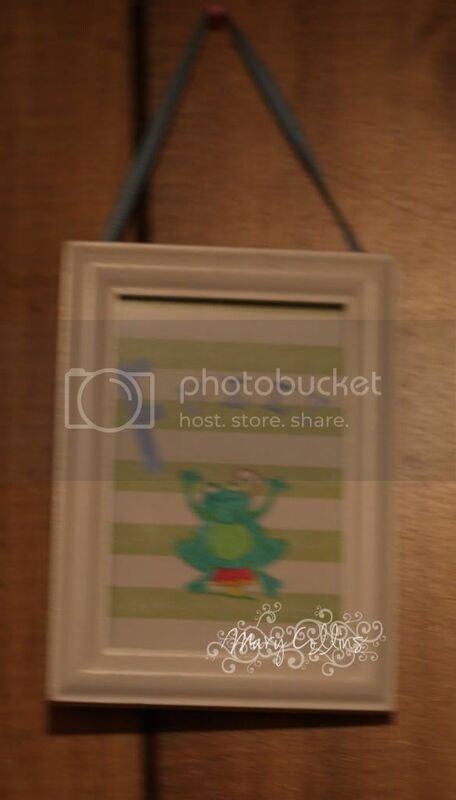 So, I found some frog material at Wal-Mart and decided I would make frog curtains since they would be relatively cheap. The collection began and now, there are frogs sitting on the hot water heater, etc... And you wanna know something else - I don't like frogs in real life!! 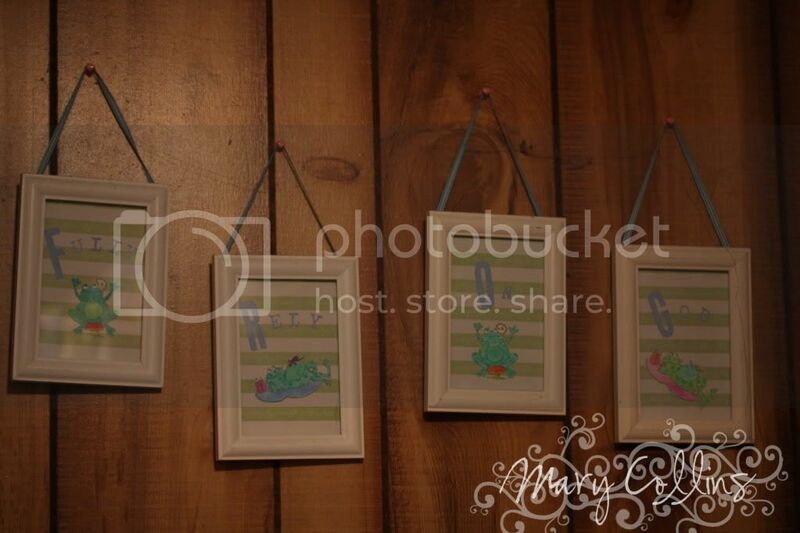 When I saw these little white frames, I knew I had to do F (fully) R (rely) O (on) G (God) with them for my laundry room! Fun on Friday over at Christian Paper Crafts today is to use an animal in your project! I hope this fits the bill! Come play along - there are no time limits, just have fun and glorify the Lord! I made this little number for a Housewarming Shower. If you look closely, you will see that the verse is none other than the Fruits of the Spirit from Galatians! 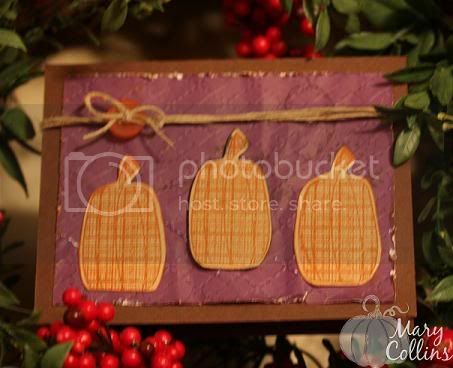 How appropriate since I used the lovely fruit stamps from PaperTrey Ink. The paper is a bit from the BoBunny Recipe collection, and the label shape was done with my nestabilities and cuttlebug! 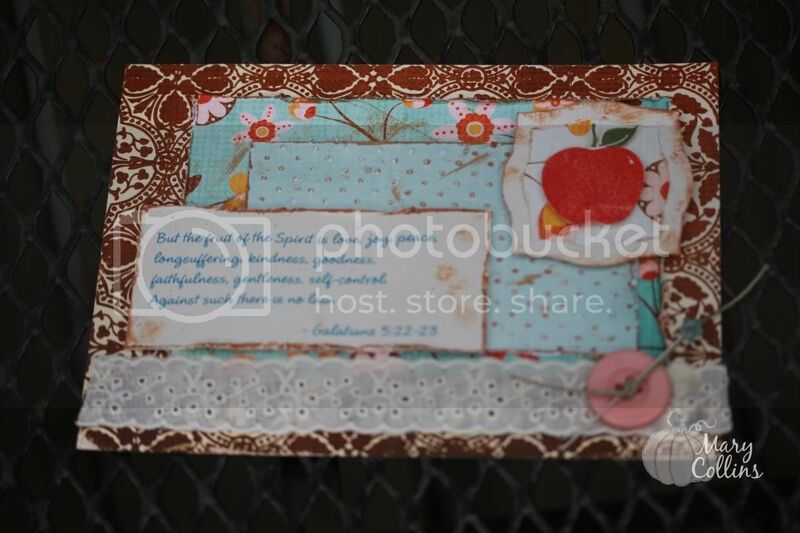 The ribbon, jute, and lace are all items I already had in my stash! I hope that you enjoyed looking and perhaps even take some inspiration to do your own handmade gifts. 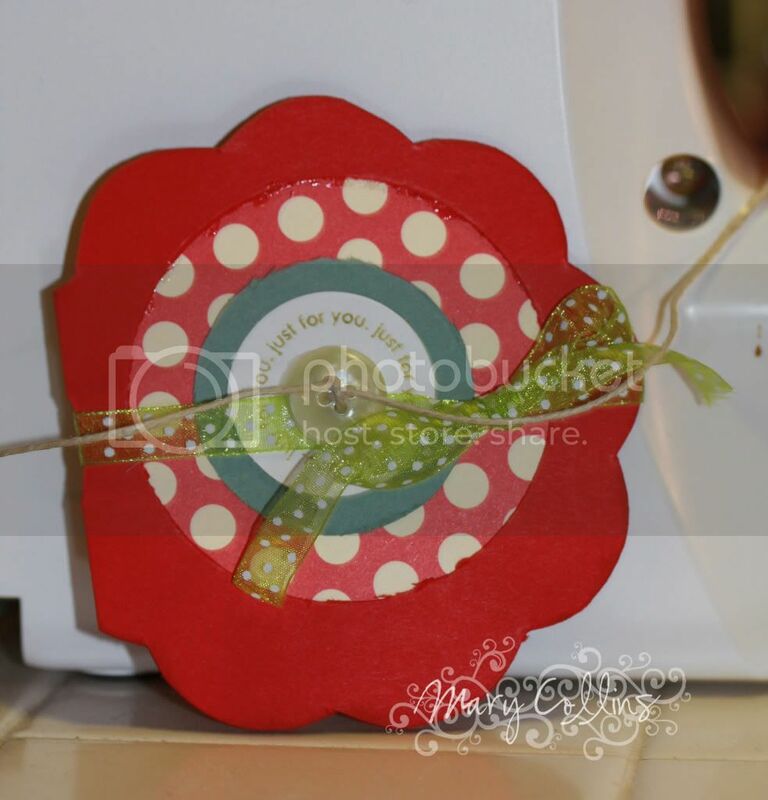 I have a new thread started over at Christian Paper Crafts titled Cheap-O's Gather Here!!! If you click on the title, it will take you right to the link. It's my hope that this thread will become a resource for homemade/handmade gift ideas for those budgeting for Christmas, but still wanting to share in the joy of giving. Please stop by and leave some ideas. If you have not registered, it is all free and fun fun fun!! Hey everyone!! 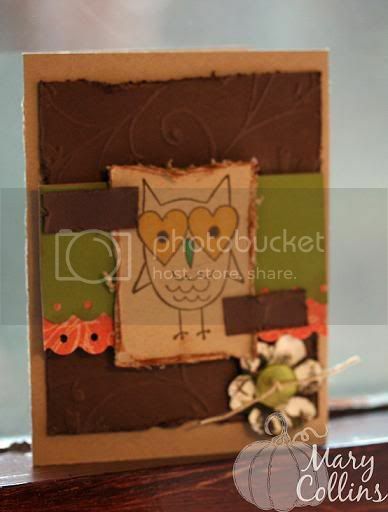 Today is World Card Making Day and what goes better with cards and scrapbooking than a sweet treat to eat? Oh, I guess a friend! So why not have all of the above! 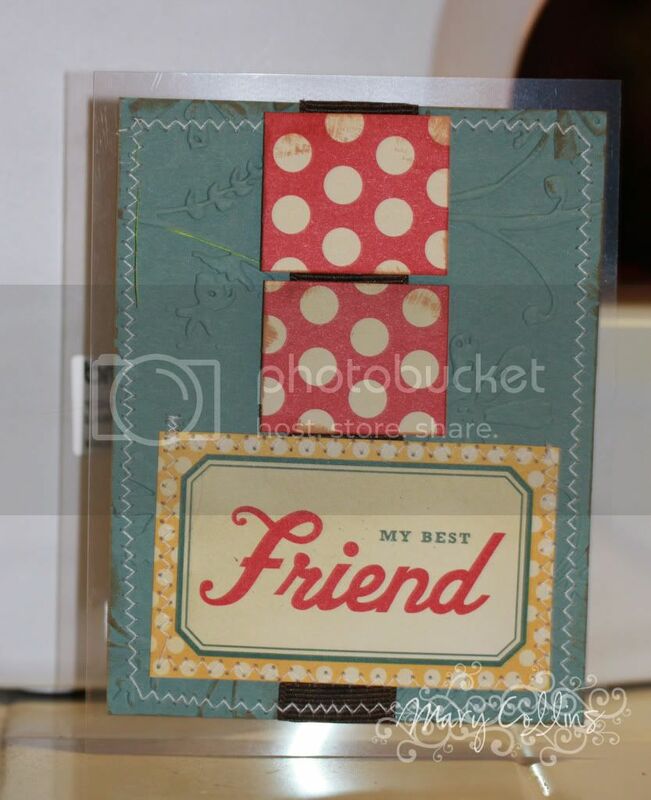 If you have a friend to scrap/make cards with, call them up and invite them over!! Or better yet, Hylton Freewill Baptist Church in Kentucky is having an ALL day Crop 4 a Cure to benefit their Relay for Life team! 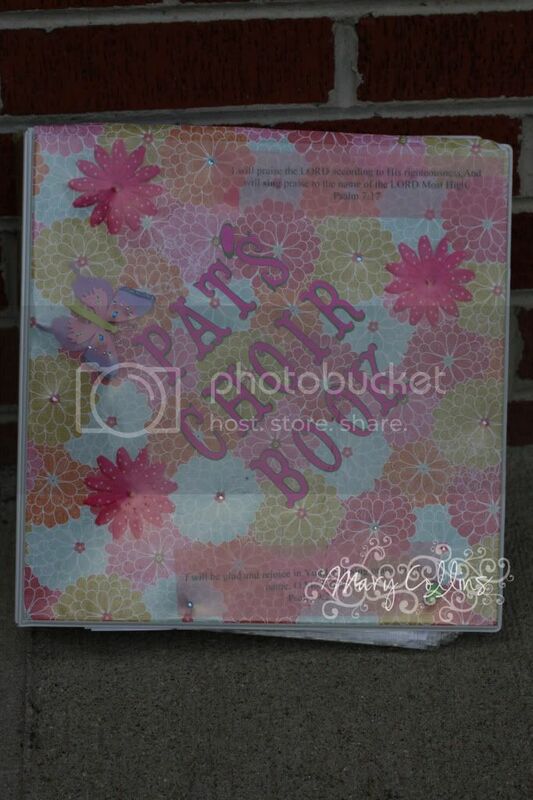 Cost is only $10.00 per person to scrapbook all day, $10.00 per person for workshops, or $15.00 for both!! Bring your scrapbook stuff and come on over for FUN, FOOD, and oh yeah, there will be PRIZES! P.S. - Scripture Saturday will be posted this evening or as a Sunday morning post! God Bless You! Sketch Tuesday of my GAP girl! Good Tuesday morning! I am so glad that you stopped in on this nice crisp Fall day! Today I am enjoying the weather - not too hot, not too cold, because all too soon it will be on the too cold side for me! 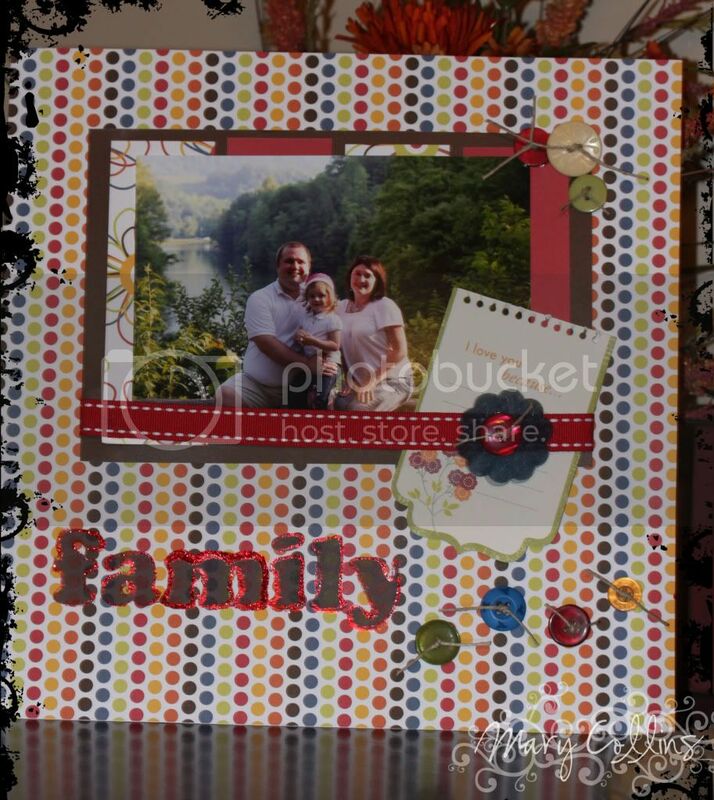 My page today follows Alisa's sketch ST25 over at Christian Paper Crafts. I just flipped it around a bit and added a little spot down in the corner. The stamped image is from Unity and the papers are all My Mind's Eye from the Laundry Line. 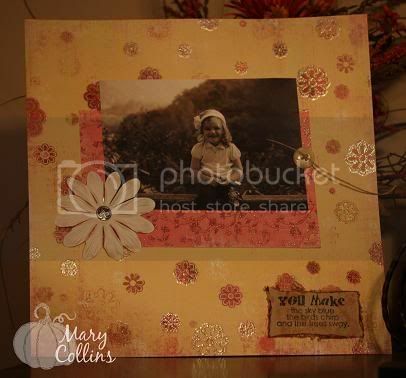 Embellishes include flower, brad, button, and jute. And the picture - that picture of Abby is in the GAP Casting Call. To vote for Abby, click here. You can vote one time per day! Happy Saturday everyone! I can't believe it is the end of September already, can you? It has rained all day here, so my pictures had to be taken inside...ugh - I love outside and natural light so much better for photographing my goodies! I was so happy to be able to have the time to play along with the 2Sketches4You sketch today! It seems like forever since I have been able to fit it in! However, with school comes even more responsibilities. Oh, and so tooting God's horn because He is the one that led me through it - received an "A" in the last nursing class :) Without further adue - Valentine in September! This next card is for 2 challenges! 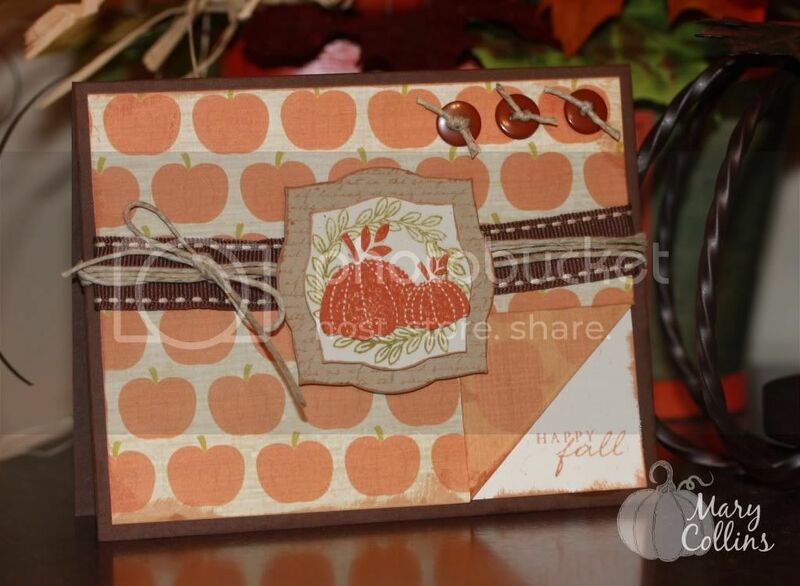 The SSS25 over at the Sweet Spot is where the wonderfully fun sketch came from and SSC5 or Stampin Sister's in Christ is where the theme for season (I chose Fall of course) is from! I was about to sit this week out over at SSIC, but I have participated every week so far, it seemed a shame to not play along this week! Have a wonderful weekend and a blessed new week! Hello again! 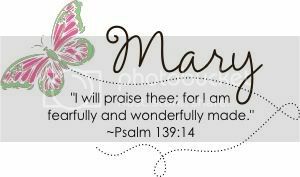 Today is Scripture Saturday over at Christian Paper Crafts! I hope that you will consider playing along. If you do, please upload to our gallery with SS009 or to the gallery of your choice with CPCSS009! Today's Scripture comes from 1 Peter chapter 4 verse 10. It is a verse that has become very dear to me as I have grown closer to God. 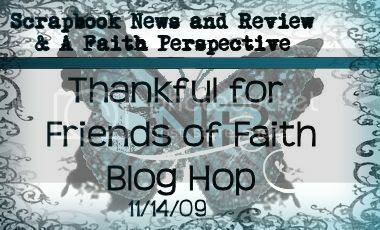 Through prayer and time with Him, I have come to understand that scrapbooking and paper-crafting is what I am to use as my tool, "gift" for Him. To God be the glory! As this has become more apparent to me, there have been doors open up, that I know only He could open, and I know there will be many more to come. We all don't receive the same gift (thankfully, how boring would that be)... However, once you discover what your gift is, remember your maker who gave it to you, and use it to bring glory and honor to His name!! And, here is my page! Hey all you Kentucky fans out there – Kevin Skinner won America’s Got Talent and we couldn’t be prouder of him! Woo Hoo! God Bless You Kevin! I have had a lot of connectivity issues over the past couple of days and hope they are getting sorted out slowly but surely. This has led to my blog being somewhat neglected. 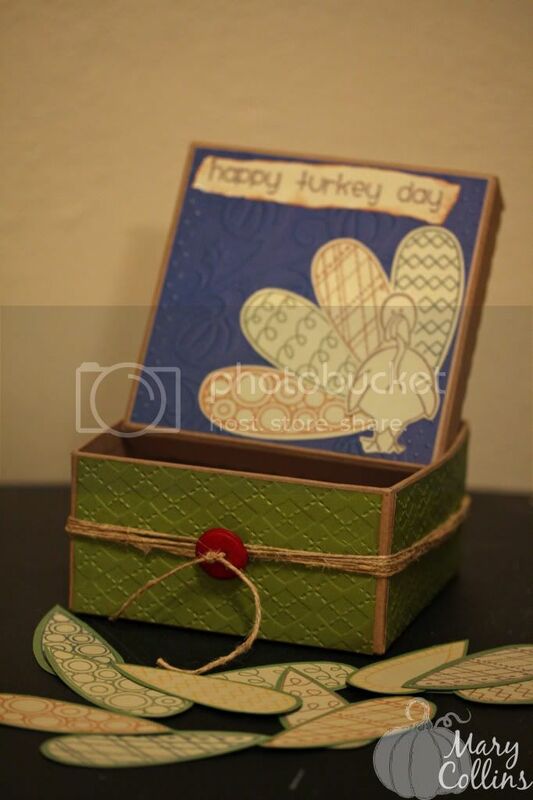 Unfortunately, I have not been able to upload to my gallery over at Christian Paper Crafts either – bummer! Come Saturday night though, MAJOR uploading if everything goes as planned! 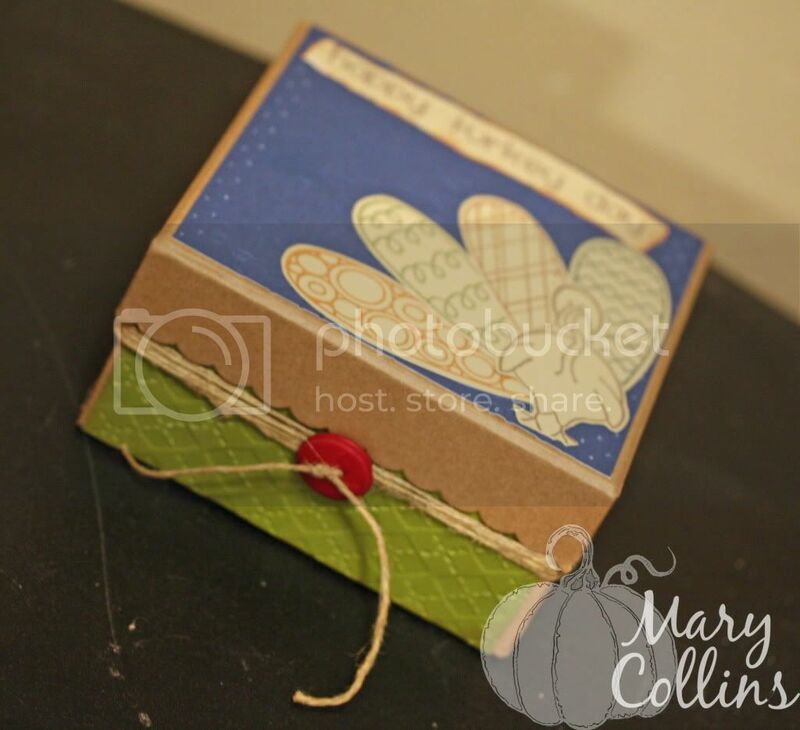 This little card is a super fun fall card made for Stampin Sister’s in Christ! 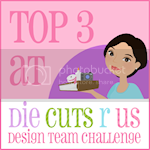 Their challenge this week was a sketch – one of my all time favorite kinds of challenges! 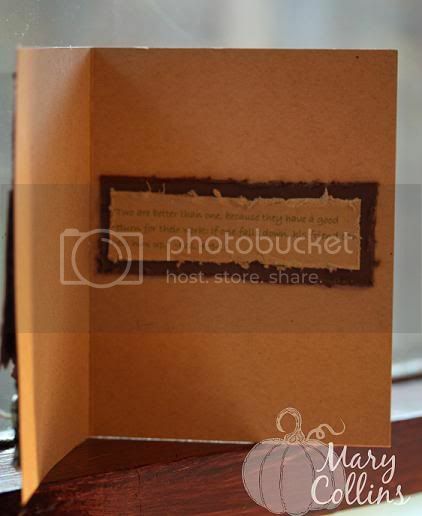 As a little FYI: you may notice that most of my cards do not have scripture on the front, it is usually because the verse inside is almost always a Bible verse. The stamps are all Papertrey Ink and the cardstock is also PTI. The ink is PTI and CTMH. 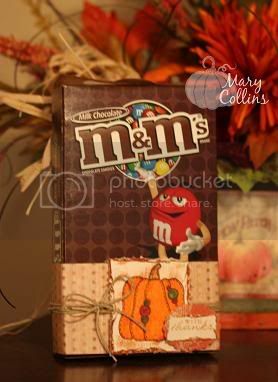 I am not sure of the manufacturer on the little pumpkin paper, but it was too cute not to use! Jute and a little ribbon finished up this cute number and has it ready to be sent!! And let me tell you, I have been busy as a little bee working on preparations for Crop 4 a Cure! Don't forget that it is going to be October 3rd from 9:00 to 9:00 at HFWB church - please email me for more details!!! The first thing I would like to do today is ask everyone to remember the HEROS of September 11th, those who were lost that day and those who are still fighting for our freedom. May God Bless. I give you framed art and a card! 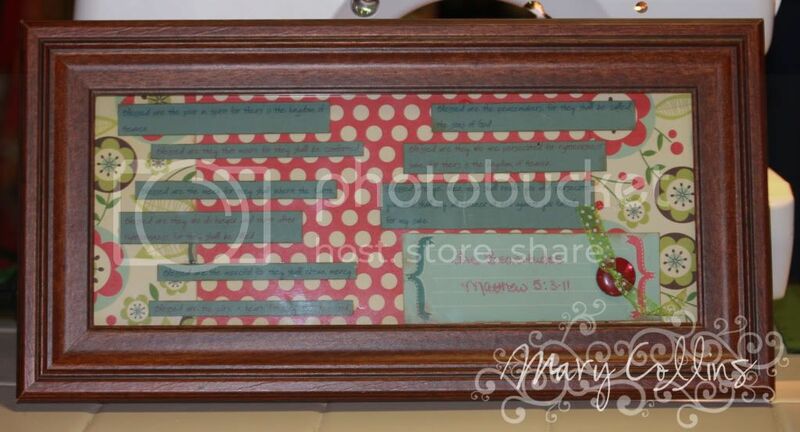 Now in the framed art you will see small writing, it really isn't that small in real life, but it is the Beatitudes. 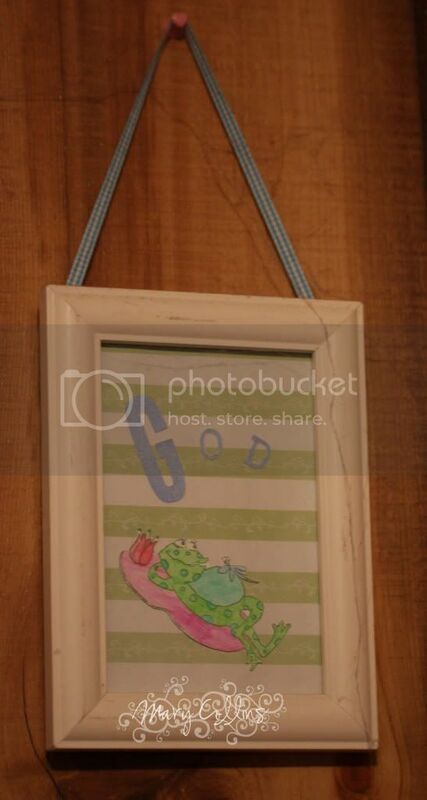 I think this would look great in a Sunday School room that uses bright colors, as all the papers are from Cosmo Cricket Early Bird, except the cardstock which is from Papertrey Ink. 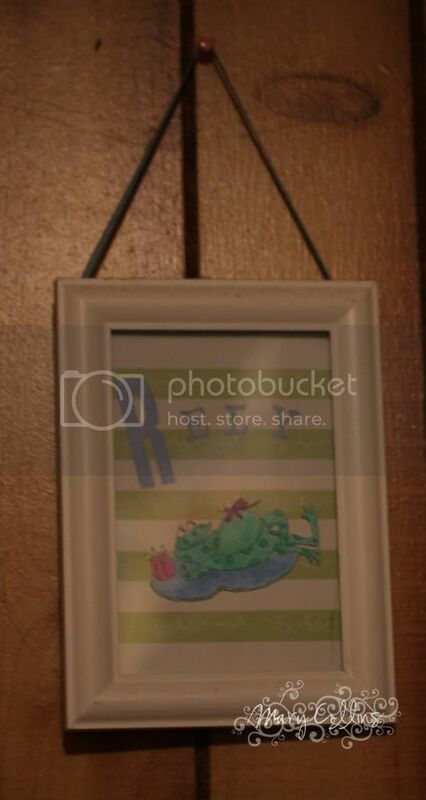 The card is made from scraps left over after the framed art was made! Although I had originally intended this for my Sunday School room, I have decided to place it in a pile for when our Sunday School rooms at church are redecorated! I will let someone else have it for their class since the colors are not what I picked out for my paint :o) And with a 2Sketches4You challenge as the layout of the card - why not add it on there too! And since it is Friday - how about an extra card for good measure! The sketch from this one comes from the wonderful Card Positioning Systems Blog! And you know what else? It is the first time I have used my sewing machine on a card!!!! I love the result, even for a first attempt! Have a wonderful weekend and God Bless You. Don't forget to stop back by tomorrow for Scripture Saturday and CASE artist Saturday! 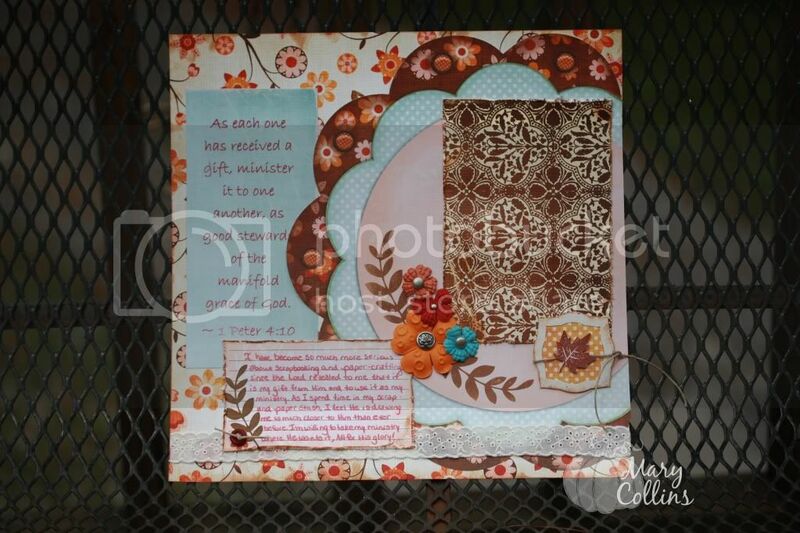 You also don't want to miss the last of the prizes going on at Christian Paper Crafts all this week! !